The Mayor of Seaford, Councillor Linda Wallraven, officially celebrated her induction as Mayor at a Civic Service held on Sunday 9th July at St Andrew’s Church in Bishopstone Village. The Service was lead by Father Trevor. Various dignitaries were in attendance, including the Deputy Lieutenant of East Sussex, Mrs Amanda Hamblin, Mayors from Lewes and Telscombe, and councillors of Seaford Town and Lewes District. Friends, family members and associates of the Mayor also attended the service as well as members of the public. Fr. Trevor encouraged everyone to join together in prayers for the Mayor, for the town of Seaford and its community. The Young Mayor of Seaford, Thomas Exley, read the first reading and the 2nd lesson was read by Councillor Terry Goodman. The Mayor's address introduced her chosen charity for her Mayoral year, Seaford Lifeguards. Peter Gwilliam from the Seaford Lifeguards gave a brief talk about the Lifeguards and their important role in keeping Seaford's seafront safe. Attendees also joined in with hymns relating to the sea and of course finished with ‘Sussex by the Sea’, all appropriate as it was also ‘Sea Sunday’. A retiring collection of £220 will go towards the Mayoral Charity, Seaford Lifeguards. Councillor Wallraven is quoted as saying “I would like to thank everybody who attended the Civic Service, it went very well and everyone enjoyed it, and thanks once again to St Andrew’s who also produced a lovely spread for the reception which followed." 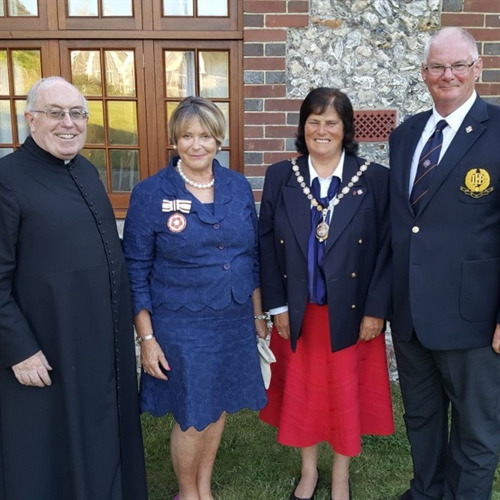 Pictured left to right – Father Trevor; Deputy Lieutenant of East Sussex Mrs. Amanda Hamblin; Mayor of Seaford, Councillor Linda Wallraven; and Peter Gwilliam, Seaford Lifeguards.